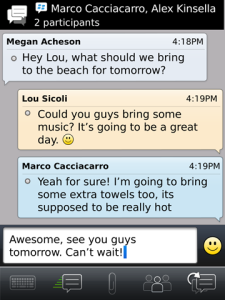 BlackBerry Messenger - Check out the next generation BBM - where apps go social! Now, BBM features are built right into many of your favorite apps, so you can share or chat with your BBM friends while you are using the app. Play games against each other while you're chatting, trash talk each others sports teams while reviewing scores, discuss a popular book that all your friends are reading, work together to find a new restaurant and share it with all your friends and more! 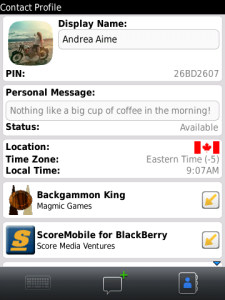 To find BBM connected apps in BlackBerry App World, search for "BBM" and download away! And, of course, there's everything you have always loved about BBM - chat with your friends and see when a message has been delivered or read; share pictures, videos, voice notes, your location or even the song you're listening to; create a BB Group to chat and collaborate with a few friends or colleagues, etc. Now, with BBM, you can meet your friends over apps! · Send voice notes more easily back and forth - streamlined voice notes allow you to set your convenience key to BBM, highlight a contact (or while in a chat), press the key, record and send. · Simpler way to change your Name and Personal Message - click on profile and start updating inline. · Tagging is now even quicker - BlackBerry Tag enhancement allows for automatic invitations and accepting within BBM. · Improved Contact Search - search will ignore special characters and emoticons to pull up all relevant contacts. · Support for Animated Avatars - display pictures can now be animated!